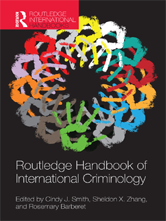 The Routledge Handbook of International Criminology brings together the latest thinking and findings from a diverse group of both senior and promising young scholars from around the globe. This collaborative project articulates a new way of thinking about criminology that extends existing perspectives in understanding crime and social control across borders, jurisdictions, and cultures, and facilitates the development of an overarching framework that is truly international. The book is divided into three parts, in which three distinct yet overlapping types of crime are analyzed: international crime, transnational crime, and national crime. Each of these perspectives is then articulated through a number of chapters which cover theory and methods, international and transnational crime analyses, and case studies of criminology and criminal justice in relevant nations. In addition, questions placed at the end of each chapter encourage greater reflection on the issues raised, and will encourage young scholars to move the field of inquiry forward. This handbook is an excellent reference tool for undergraduate and graduate students with particular interests in research methods, international criminology, and making comparisons across countries.